The Eurovision Song Contest was seen by almost 200 million viewers in its 60th anniversary year. The three live shows from Vienna, Austria on 19, 21 and 23 May reached 197 million people in 40 countries – 2 million more than in 2014. 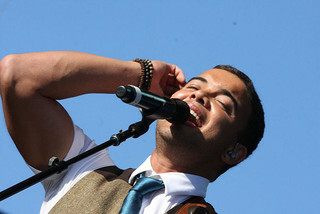 Australia’s first official Eurovision contestant, Guy Sebastian, has delivered record ratings to SBS. More than 4.2 million Australians watched at least five minutes of the semi-finals or grand final over the weekend, broadcaster SBS claims. The split results of the Eurovision Song Contest 2015 have been revealed by the European Broadcasting Union. Italy was the overwhelming winner in the televote of yesterday, whilst the actual winner Mans Zelmerlow for Sweden took the jury vote by a landslide. After thirty years of broadcasting, more than ten years of immense popularity and several years of longing – tonight it is time for the real thing. Australia will take part in the Grand Final of the Eurovision Song Contest 2015 in Vienna. 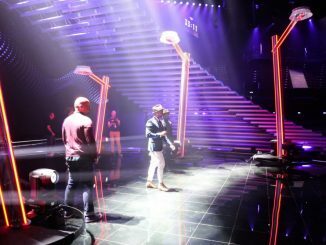 After their performance in the Dress Rehearsal of the Grand Final, Mans Zelmerlow from Sweden and Australia’s Guy Sebastian got together in the greenroom. They complimented each other openly about their performances and showed the world what Eurovision is all about. So it’s the day the Grand Final, and we start the day as usual, with a cup of coffee. Hear what Steef van Gorkum, Neil MacInnes and Dennis van Eersel of ESC Daily think about the outcome of the 60th Eurovision Song Contest.